Having a special interest in the defunct Nekrophilie Rekords, run by Michael DeWitt (Zero Kama & Korpses Katatonik) from 1983 to 1990, here is another great edition of the same. LAShTAL was ittalian project active in the 1980s created by Lapo Lombardi and Andrea Da Costa with a help of another friend Maurizio Fasolo. They have released only one album, both name of the band and the record are related with the works of Aleister Crowley and Thelema ("Do what thou wilt shall be the whole of the Law. Love is the law, love under will.") ceremonial magic developed by him in the early 1900s, based on ancient Egyptian religion. 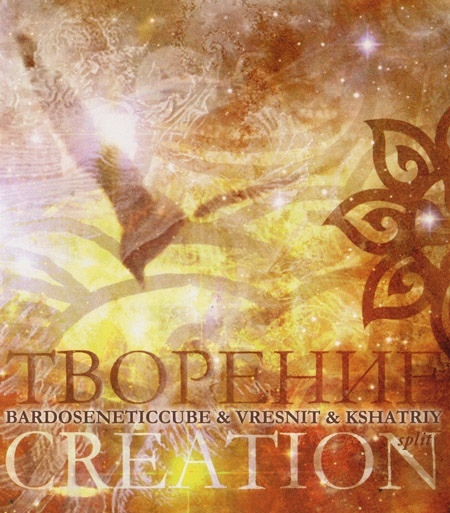 The name of the album referes to "Liber Resh vel Helios", by Crowley, comprises four daily adorations to the Sun, to be performed at dawn, noon, sunset, and midnight. The general object is to focus the conscious mind on the center of our solar system. 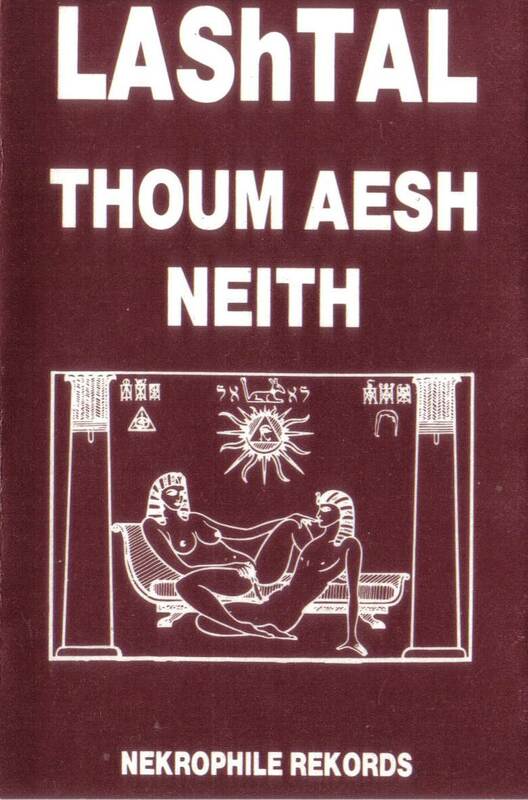 "Thoum Aesh Neith" is the sun salutation made at noon. Let's talk now about LAShTAL sound, in which I must highlight the track "There is no God but man" full of beauty, enhanced with female choruses that thicken its mysteriousness. However, due to some experimental reverie, understandable at the time it was created, which could be a perfect record of ritual inspiration, turns it sometimes something with a split personality, not being something derogatory, because I strongly recommend your hearing , I think that if the project had continued and followed the ritualistic line, we would have had many good surprises. 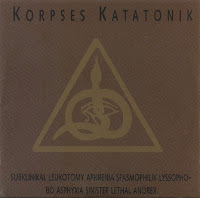 For the new entry in the blog, it was chosen KORPSES KATATONIK, the first sound incursion of Michael DeWitt in 1982, before the creation of Zero Kama. 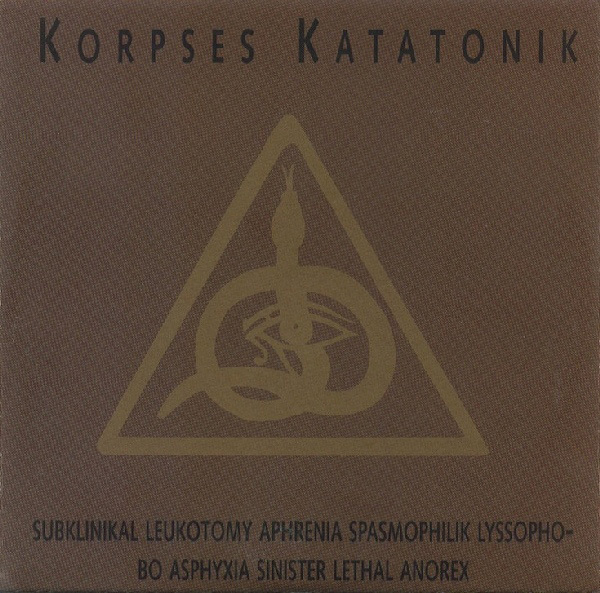 In "Sensitive Liberated Autistiks" also released by Nekrophile Rekords, it is recognized the first drafts that would be the logical follow-up to the emergence of Zero Kama, however, the experimentalism and industrial essence, is marked throughout the 48 minute duration of this record. It is not something I would recommend for a less seasoned listener, but surely will be a good find for those who have an open mind. ZERO KAMA was the first artist I posted on the blog Ritualistic Nature (16-09-2008), which consequently is on my list of favorite projects, wich I highly recommend. I would say that is something that should be heard at least once in our lives, regardless of musical tastes of each one of us. Zero Kama has long been a reference name to drop in ritual ambient circles. The project was founded in 1983 by musician Michael DeWitt, and at the time, contemporaries of Z.K. who were also engaged in the creation of post-industrial music with a heavy occult influence included the British groups Psychic TV, Current 93, Coil, and the italians Ain Soph. Unlike all these other bands, however, Z.K. manifestation on the material plane was brief and fleeting. 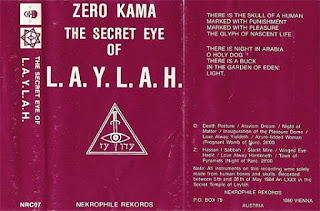 The project ceased to exist in 1986, having released only one album "The Secret Eye Of L.A.Y.L.A.H. ", which appeared on cassette on Michael Nekrophile Records label, as well as a handful of cassette compilation appearances. This obscurity has only added to Z.K. is cult reputation. All instruments to be heard on this album were exclusively made from human bones and skulls by the hand of Z.K. 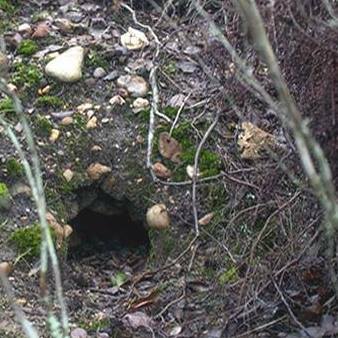 They never have been used since the time of its recording, which took place at the Secret Temple of Laylah from 5th to 28th of May 1984 . Remixed at Psychonaut Studio Vienna in November 1987, and dedicated to the symbol of Laylah, meaning night and death, as well as to its numerical equivalent, Oz, a goat or unrestrained sexual force of creation, thus showing the identity of the basic two opposite forces in this generous universe of beauty and strength, in which the Lovers my find ecstasy in Pan. PAEAN PASSAGE rose from the ashes of Ritualistic Nature, which in turn was born on the Sixteen of September Two Thousand and Eight, from the shadows of another blog that i was a contributor "The Rosemary Locale" ( http://darkobscurity.blogspot.pt/ ), the blog is still alive but almost of the links are "dead" now. The reason why i decide to start R.N. has been because I've always had great interest in ritualistic sounds and also because I'm a Nature lover in all its forms. Paean Passage will follow the steps left by R.N. , here i will uploading some of the old stuff posted there since 2008. The new posts will be tagged with a number and genre(s) that best identify what i share here. But i need some help, i have lost most of the music files, thus, from time to time, I'll ask if someone has the same I lost, to post again, with due thanks to those who provided them. Fell free to send me your musical proposals, and maybe I can review them here. But there is a rule, if i like it, a post only the entire record, not one track or two. Finally, thank you for all your nice words and support since i start the R.N. 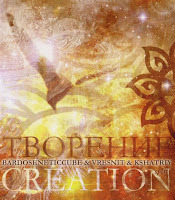 project, and enjoy the music that these talented artists have created for our delight.